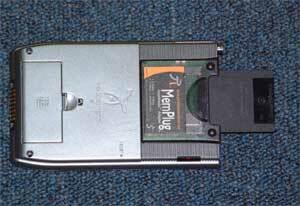 When I received the MemPlug, I was pretty excited since this was my first Springboard module for the Visor. Upon opening the envelope I found the MemPlug box and a 16MB SmartMediaTM card taped to the side. 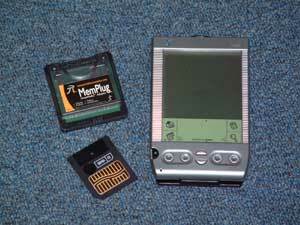 The MemPlug package includes the actual MemPlug Springboard module, the gMovie Maker CD, and a user guide. Installing the MemPlug doesn't require much work. All you do is remove the Springboard cover from the back of the Visor and plug in the MemPlug. If you don't have a SmartMediaTM card in the MemPlug when you attach it to the Visor, nothing happens. Once I inserted the SmartMediaTM card in the slot on the MemPlug, my Platinum turned on and several new applications appeared. Now I was ready to transfer files to the card and even view pictures/movies that are on the card. The MemPlug fits rather snug in the Visor's Springboard slot. It adds weight to my Platinum, but not so much that it's annoying. The construction of the MemPlug itself is pretty solid. It also makes my Platinum a little thicker with the back of the module bulging out a little. The entire thing still fits into my PDA case, so it's no big deal. The only thing that's really annoying is when a SmartMediaTM card is in the module. The card sticks out of the top slightly, enough so that my Platinum's cover doesn't fit over the back. This is to allow the SmartMediaTM card to be removed easily. So, you'll have to hold the cover while the module is in use. Next, I decided to install gMovie Maker and start transferring movies to my Visor. I installed it from the CD that came with the MemPlug. A few minutes later, I was converting some of my *.AVIs to be played on my platinum. Since I don't have a Prism, the output is gray scale, but it's still looks pretty cool. Now that everything's installed and ready to go, let's see what this MemPlug can do.